Join CAM for a basketball block party for all ages celebrating the new exhibition Above the Rim presented by PNC. Food + supplies drive for eastern North Carolina hurricane relief efforts. Bring paper towels, cleaning supplies, and your favorite canned soups. 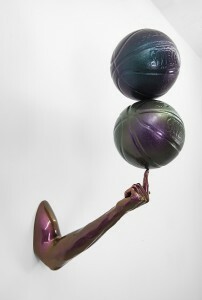 Image: Hank Willis Thomas, Globetrotter, 2016, fiberglass, chameleon auto paint finish. Image courtesy of the artist.